The brand new XPedite5650 from Extreme Engineering Solutions (X-ES) is a conduction or air-cooled Mini COM Express module (55 mm x 84 mm) supporting the Freescale QorIQ P2041 quad-core processor. 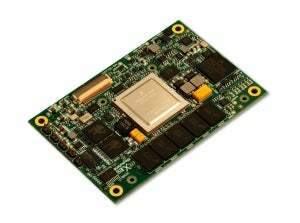 With four PowerPC e500mc cores running at up to 1.5 GHz, the P2041 delivers enhanced performance and efficiency which combined with the rugged design and small size (less than 20cm²) means the XPedite5650 can provide the processing subsystem for a wide range of SWaP constrained applications. Linux, Wind River VxWorks, and Green Hills INTEGRITY BSPs are available. The XPedite5650 is a COM Express mini form factor (55 mm x 84 mm) with an enhanced Type 10 pinout, which can be easily integrated into a rugged Small Form Factor (SFF) enclosure, such as the XPand6000 series, which supports natural conduction or convection cooling. XPand6000 series systems combine high-performance processing and application specific I/O added via PMCs/XMCs, such as MIL-STD-1553, CANbus, video input, RS-232/422, GPIO, A/D, and D/A for the most SWaP constrained applications. To facilitate development of the XPedite5650 X-ES has engineered the CX-DP development platform – a desktop setup with standard I/O connectors. It provides basic COM Express I/O via fixed connectors, accessible through the back panel of its ATX chassis, and simply removing the ATX case cover provides access to internal fixed I/O and PIM I/O. X-ES has the tools necessary for customers to be successful with the XPedite5650 whether they are integrating it into their own system or utilizing an X-ES SFF system.